AZ05. 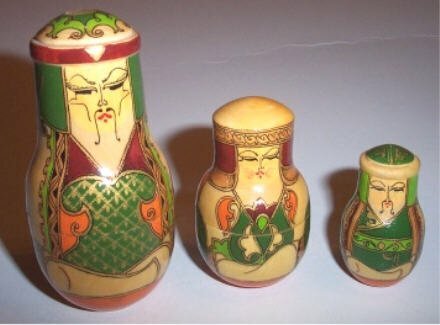 Kazakh Royal Family (red) 3n, 4.5"
This set is similar to the above set but is painted in green orange and red tones. This Mongolian family is dressed in color, ornate robes. They sit with their legs crossed and their hands resting on their knees. The folds of their Arabian pants can be seen in front. Under their hats they have long scarves on the sides and even longer and very ornate scarves down their backs that end in tassels at the waist.